These were first published in Russia Insider, respectively here, here and here. Especially as the shattering scale of destruction becomes apparent – Poroshenko says that Ukraine lost two-thirds of its military equipment (just one video of dozens) – Westerners who have been misled by the propagandist character of their media outlets are ready to believe that Russia must have been supplying the rebels with weapons and ammunition. While it is likely that some stuff crossed the border, there is another source that few Westerners are aware of. What most Western commentators do not understand is that the USSR was preparing to fight World War II all over again with huge armies fleshed out with millions of conscripts and reservists. Millions of soldiers need immense quantities of weapons and ammunition and they need them to be ready and waiting for them as they are mobilized Consequently there were arms dumps all over the western USSR. Most of these sites were named as the headquarters of a division which had a skeleton staff in peacetime but would receive a flood of reservists who would find everything they needed to go to war with waiting for them. When the whole thing stopped, this system was torn apart. Russia assumed responsibility for the stuff in the Warsaw Pact countries and Ukraine, for example, nationalized what was in its territory. As to the forward-based Cat I formations, Russia wound up responsible for the equipment and moving it to Russia, as to the personnel, the conscripts went home and the various nationalities went to their own countries. In short, almost overnight a tank division all ready to go would be turned unto an understaffed pile of equipment waiting to be quickly moved into Russia. I don't think there were any Cat I formations in the Belarussian SSR and Ukrainian SSR; I think I remember that they were all Cat II there. These movements were accomplished quite quickly and the whole carefully constructed arrangement was destroyed. I used to explain what had happened with the analogy that Russia had got the spear head and Ukraine and Belarus had got the spear shaft; neither being much use without the other. But the enormous supply dumps necessary to bring Cat II divisions up to Cat I would have remained in Ukraine (and Belarus). For some years Russia pretended that sites on its territory were actual divisions (I was in regular contact with our CFE and Vienna Document inspectors through this time) but the only things inspectors would ever find when they went to inspect the location of an so-called motorized rifle or tank division in the 1990s were fields of poorly maintained AFVs, officers and no troops. (We used to speculate that the secret that the Russians were guarding was that they had no soldiers – oh, they’re all out on a training exercise; oh yeah, with no officers and no equipment? But, as the CFE Treaty only covered equipment and the Russians were completely open about that, there was no problem.) Incidentally, training was impossible: I remember a Russian woman telling me that her brother was a company commander – he had two soldiers in his company! “Empty formations” was the expression used. Then, suddenly one summer (I can’t remember the year: some time between the two wars in Chechnya), we received a blizzard of notifications (as required under the CFE Treaty) each saying something like “remove the xth MR Div from the list; enter the zth Storage Base at the same location”. When all this was completed, there was a much smaller number of divisions (which were gradually being transformed into independent brigade groups) and many storage bases. After thinking about it, we decided that the storage base idea was an attempt to provide employment in lieu of pensions for surplus officers. (In meetings at this time, the Russian military were always telling us that they simply could not afford the pension and housing obligations for the hundreds of thousands of unnecessary officers. Other ranks were easy to reduce, of course: as they’re conscripts, they can just be sent home early). These changes also recognized the reality that the old Soviet formations had gone forever. Nothing like this happened in the Ukrainian Armed Forces. So one can expect the territory of Ukraine to be littered with piles of poorly guarded weaponry and “empty formations”. A Russian official recently confirmed this when he said: “When the USSR collapsed, the Ukrainian territory was replete with millions of guns, mines, artillery systems and other weapons. The area where the combat activities are held today, where Kiev leads its punitive operation, is no exception — there were weaponry warehouses which the militia seized.” Slavyansk, in particular, is said to have a particularly large dump in an old mine. So, I have no difficulty seeing the rebels coming across (or being directed to) a dump and getting weaponry and ammunition; they have people who can get it working again and plenty of ex-Soviet Army veterans to make them work. On top of that is the equipment captured when Ukrainian conscripts abandon positions (quite a lot – this site attempts to make a photographic record) and a few things bought or bribed. So far all they would have needed from Moscow is maybe some command and control equipment and target acquisition services. So Ukraine's military problem today is that it has the two-decades decayed remnants of what was originally planned to be a first line of support for the best and most ready elements; never to be a stand alone force. And during this time Kiev has starved this remnant and sold off the best stuff abroad (Georgia got a lot from Ukraine). So, the rebels and the Kiev forces are much more evenly matched than would be the normal case in a rebellion against the center They are both learning on the job, but the rebels have much more motivation while Kiev has a larger stock of weaponry on which to draw. Many in the West probably wonder how the the Ukrainian rebels can be defeating the Kiev forces without help from Russia. But this has happened many times before; good little guys often beat bad big guys: the Vietnamese beat the Americans, the Israelis beat the Arabs in 1948. But, for our purpose, it’s worth considering how the Finns beat the Soviets in the Winter War. In 1939 the Soviet Army invaded Finland along the entire border. 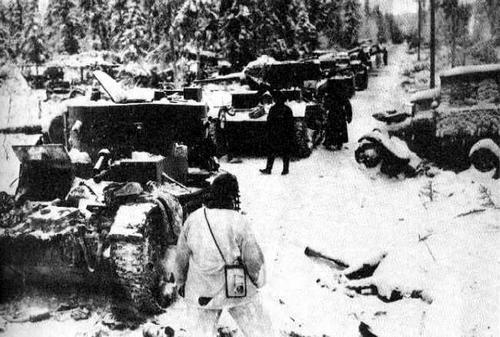 The Finnish Armed Forces were small and not very mechanized but they were determined and they knew the ground they were fighting on – it was theirs, after all. The Soviet Armed Forces were large, highly mechanized by the standards of the time but poorly led (Stalin had killed or imprisoned the best commanders a year or so before). Much the same thing happened in eastern Ukraine; the favorite word there being “cauldron” or котёл. The principal difference being that you can create motti in forests, but only a котёл in steppe land. I no know better description of how to create one than the Saker's. But it is very much the same as how to make a motti. Road-bound, poorly commanded heavily mechanized units advance too far and are cut off. Sometimes they can fight their way out but it’s a declining situation if they stay: every day they have less food, fuel, ammunition and water. If they don’t fight their way out, they die or surrender. In Ukraine it’s summer, so at least they don’t freeze to death as thousands of Soviets did in the motti. And another similarity, and a very important one, in eastern Ukraine and Finland as well as Vietnam, Afghanistan, Israel in 1948 or Iraq is, to quote James Clapper, the director of national intelligence (USA), is that the attackers don’t “predict the will to fight”. In June Poroshenko was talking about the whole thing being over quickly: “in hours, not weeks”. The two decisive weapons of this war that have given victory to the rebels are the MANPADS (MAN Portable Air Defense System) and the Grad (“hail” in Russian). Kiev had, at the beginning, complete air superiority; it may not have had very many helicopters and ground-attack fixed wing, but it had all that there were. Against these the rebels had stocks of the SA-7 shoulder-fired missile. Like many Soviet weapons it was modified and improved in incremental steps over its service life since the 1970s and produced in quite large numbers. It has an infra-red guidance system and is shoulder-fired. Like most weapons of this type, it is most effective against aircraft that are actually attacking the firer, ie when the angular momentum of the aircraft is low. According to this site, quoting the Kiev Post, Kiev lost ten helicopters and nine fixed-wing aircraft. The true number is likely higher but the point is that this weapon system effectively nullified the air superiority that the Kiev regime had; they either destroyed the aircraft or forced them to fly higher and faster and therefore be less effective. These weapons made the war into a ground war. The real destruction of the Kiev forces – Ukraine President Poroshenko says two thirds of Ukraine’s military equipment was lost – was carried out by the BM-21 Grad MLRS. Another weapon system from decades ago, this is a truck with 40 122mm rocket tubes at the rear. Not particularly accurate – it is what is known as an “area weapon” – the fact that all 40 rockets can be fired in 20 seconds means that after a few ranging rounds a terrifying amount of explosive can be delivered very quickly by a few Grads. Here are a lot of them firing at a demonstration. Here are some videos from the fighting in Ukraine. Grads firing at night – we see the ranging rounds and then the full salvo from two. Hits nearby. This is what remains after a strike. There are dozens of videos showing the destruction of Kiev forces trapped in a “cauldron” or котёл by Grads. As I said in another essay, the bulk of the rebel forces were men who knew the area: the back roads, where this forest trail comes out, where that hill is and how to get there without being seen. The Kiev forces did not know the area and had ludicrously inadequate maps (one report spoke of maps from the 1920s) and bad information; thanks to their reliance on heavy equipment they stuck to the main roads. Their commanders were spectacularly incompetent, they themselves were either either poorly motivated untrained forced conscripts unwilling to advance or gung-ho “volunteer” forces, pumped up with warrior fantasies, who charged down the road and got trapped. In either case, there would be periods of being stopped, all jammed together when the mobile rebel spotter forces would call in the target. A few adjustment rounds, then a hundred or more rockets. This is what would happen, over and over and over again. All done by discreet spotter teams and a few Grads within twenty kms or so. Therefore, there is no particular reason to assume any large-scale Russian military assistance here. Dedicated people fighting for their homeland, on their homeland, have beaten many a bad invader. Add to this the military training left over from the Soviet days, the weapons stockpiled in the area against a future huge war, mechanical ability and the incompetence of the invader, it is not surprising that they have held their ground.